You have discovered Love You to the Moon, a little site about the character of Bing Bong from Pixar's powerful 2015 film Inside Out. This site takes you through the plot of the movie as it applies to Bing Bong, and then into an in-depth analysis of his character and his importance to the story. Even if you've never seen this wonderful film, I encourage you to stick around--there's plenty here to enjoy! 2016 Shrine Revamp Event Participant! further reading | credits | affiliate/link exchange? September 2016: Love You to the Moon has gotten a complete revamp as part of the Amassment Shrine Revamp Event, with a tidier layout, better plot play-by-play, 700% more illustrative images, slicker formatting, and much lovelier font choices (courtesy of Google Fonts). Come experience Inside Out and Bing Bong's role in it as if you're watching it for the first time! 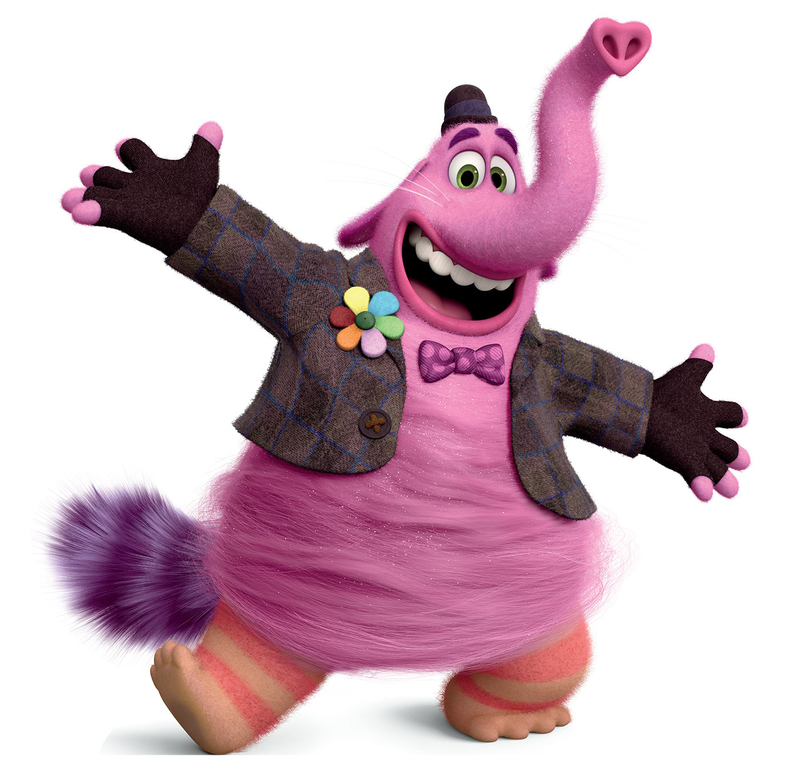 Bing Bong is the imaginary childhood friend of 11-year-old Riley (seen above), who is the living setting of Inside Out--about 80% of the story takes place inside her head, and the protagonists of the story are anthropomorphized versions of her emotions (Joy, Sadness, Disgust, Fear, and Anger, seen below). Each of the five emotions can drive Riley's reactions to the events around her, and they also each have charge of the memories in Riley's head; most of them are happy memories so far, tinted the golden color that belongs to Joy. But Riley's life soon gets shaken up big-time; her family moves from the only home she's ever known, and she's got to start over at a new school halfway across the country. And, as Riley navigates life in a strange new city with no familiar home or friends, Joy is finding it harder and harder to keep Sadness from tainting every memory around her. Sadness and Joy end up fighting over a couple of the core happy memories in Riley's mind; Sadness merely wants to help out, but her touch turns every core memory sad and Joy can't stand it--to her, it looks like Sadness is intentionally wrecking everything she's worked so hard to maintain. In the process of trying to keep Sadness at bay, Joy accidentally gets sucked up into the Long-Term Memory chute along with several core memories, and Sadness quickly follows. They get spat out into the winding, brain-shaped shelves of Riley's long-term memory, far from Headquarters and their friends. ...until they discover Bing Bong, a self-described "part cat, part elephant, part dolphin" made of cotton candy. He's been wandering around Long-Term Memory, mostly ignored, kind of eccentric, gathering his happiest of memories with three-year-old Riley into an ever-expanding bag. He seems to know his way around and wants to help them get back, so the three of them set off together. Since Joy and Sadness are trying to get back to Headquarters (main thought processing), Bing Bong does his level best to help them...well, except that he thinks much as a three-year-old does. This poses a few problems for the trio on their journey--first, Bing Bong's naivete leads the group into Abstract Land, a void-like shortcut between Long-Term Memory and Preschool World, and nearly gets all three of them killed as they are broken down into mere concepts of themselves (seen below). And then, after barely escaping into Preschool World, Bing Bong discovers, to his horror, that so many of his favorite old places are being dismantled and destroyed (like the flattened gingerbread house, below). ...but unfortunately, their trip is short-lived; the Train's spindly track begins to splinter apart as they are crossing the Memory Dump, a vast, deep chasm where old memories lie like so much junk before they fade. Its cars wreck against the Long-Term Memory side of the chasm. Joy, Sadness, and Bing Bong narrowly escape the train car they were riding in before it falls over the side, but now they are stuck without much of a ride over to Headquarters. Now desperate, Joy tries to get in one of the memory chutes, seeing if it will take her back up to Headquarters, but instead the ground beneath the chute trembles and splits apart, separating Bing Bong from Sadness and sending Joy free-falling into the dark abyss. Bing Bong tries to help, but stumbles and falls into the chasm along with her. Initially Bing Bong fears all is lost, especially because he's already beginning to vanish, but he soon reunites with Joy and they start regrouping and strategizing. Soon enough, the pair catch sight of his "rocket", a Radio Flyer wagon powered by song, fitted with rainbow-shooting broom rockets on either side. Joy realizes that if they sing enough, they can ride the rocket up to the top of the chasm! Together, they use a tall hill of piled-up old memories to get a good run-and-go, launching the "rocket" upward, singing to power its engines as it is in flight. But the rocket has lain down in the chasm too long and it is in disrepair--it simply cannot carry both Bing Bong and Joy, and twice they fall back into the pit. Joy is just about in tears, and Bing Bong gently encourages her--"let's try just one more time. I've got a feeling about this time." So, they climb back into the wagon, and Joy begins to sing frantically as it rolls down the hill and launches up into the air--she's struggling so hard to make it up to the top of the chasm. Sitting at the front and immersed in her task, however, she doesn't see that Bing Bong eases himself out of the rocket and falls back into the Memory Dump, allowing her to ascend quicker and easier. Joy crests the cliff at last, and the rocket lands, breaking into pieces upon impact; she lands safely amid the debris, curling her body around the precious core memories she's carried all this time. She gives an elated shout...and then realizes that Bing Bong is missing! Looking back down into the dark chasm, she sees Bing Bong, who triumphantly dances and shouts, "YOU MADE IT! Go! Go save Riley!" Then he smiles, sadly, bravely, and whispers, "Take her to the moon for me. Okay?" before dissolving into forgotten mist. Because we all need one, am I right??? 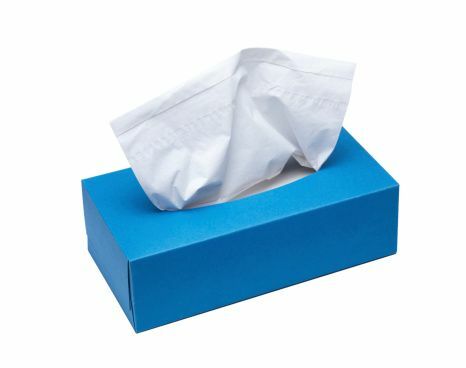 Okay, I got my tissues now. You got yours? Bing Bong's death left me shaken, sobbing in great, chest-hurting gasps--and I wasn't the only person who reacted that way, as the sobbing in the theater attested. I understood why the little ones were crying; children can grieve over Bing Bong because he is much like their own imaginary friends, and the loss of him is like losing a necessary part of their hearts. But I wondered, "why would I, an adult, react just as emotionally?" It is a sometimes-horrible necessity of life: constant change and adaptation. Just as a tree's flowers must wither for its fruit to form, just as baby teeth must fall out for permanent teeth to grow in, so must childhood give way to adolescence and adulthood. Bing Bong comes to realize that Riley doesn't need him anymore; she's no longer a child to follow him on flights of fancy, but is becoming a young woman--a young woman who will need her Joy. Bing Bong, despite being childlike, is also a quasi-parental figure, a permanently happy guide for little Riley as she explored her newfound world. He also functions as such a guide for Joy and Sadness as they journey through Long-Term Memory and strategize on how to get back to Headquarters. And just as we lose our imaginary childhood guardians and much of our access to imaginative spaces as we mature and go through traumatic experiences, we also lose our parents and other loved ones by physical death. The loss of Bing Bong, thus, also mirrors that familial grief which we have either already experienced or face with apprehension. Bing Bong's "death by forgetting" is even crueler because Riley will not even feel the loss of him. His last words, "Take her to the moon for me," show that he appears to realize this. Yet he sacrifices himself anyway, because it simply must be done; he knows she has no real use for him anymore, but there is one last thing he can do for her, one last gift he can give. His selfless action makes the rest of the movie possible, and allows Riley to grow up as he knows she must. It is only at this point in the movie that we realize just how instrumental Bing Bong has been for Joy and Sadness to make it this far--and how wonderfully brave and wise a character he truly is. And thus, the tears flow, for the loss of someone who has become suddenly so dear over the course of just half the movie. His character reminds us of the people in our lives who have sacrificed much--even, perhaps, all--for our safety, our growth, and our well-being. So often, we don't even recognize this until much later in life, and sometimes, we utterly forget them as well. Our grief for Bing Bong, as silly as it might seem, jogs old memories of kindnesses past from our own Memory Dumps...and his fate reminds us that one day we will only be faded memories in someone else's mind. Bing Bong is quite literally the best friend Joy could have asked for, both in his wisdom and in his humility--the unconditional love he bears for Riley motivates his action. This is why, after Bing Bong has faded, his last request still hanging in the air, Joy bows her head and whispers, "I'll try, Bing Bong." She knows she must continue on and not waste the gift he has granted her. Is Bing Bong truly gone forever, though? According to this quote, perhaps not, if Riley becomes as creative an adult as she is in childhood. True, Bing Bong as a friendly imaginary cat/dolphin/elephant may have vanished, but perhaps his happy, exploratory "spirit" will live on, inspiring Riley to create future art, music, literature, etc. The same mental impulse that created Bing Bong in the first place still exists within Riley, after all. So maybe this is why Bing Bong faces his death with a wistful sort of calm--maybe he knows it's not really the end, but just a change for him. I selected "Fly Me to the Moon" and "Toyland" to represent Bing Bong--the former captures his boundless charm and happy-explorer spirit, even in a song that's actually about romantic love. "Toyland," by contrast, is both a sweet song about an enchanted place for children, and a wistful ballad about a place you can never go back to. A more fitting song for Bing Bong simply does not exist yet. How Bing Bong kind of steals "Inside Out"
Any site about an animated subject is welcome, especially Western animation! Please save to your own server!